Ten years after Skate America took place in Everett, the first Grand Prix of the 2018-19 season came back to this city of 115,000 people in the State of Washington, just 25 miles north of Seattle. The rink has a new name: It is called now “Angels of the Winds” Arena, named after the local enterprise which runs a casino and a hotel in Everett and is in possession of the Native American tribe of the Stillaguamish. This tribe paid 3.4 million Dollars for the new rink name from 2018 to 2027. As this is a post-Olympic season, at least one third of all skaters made their Grand Prix debut, whereas some top skaters finished their career or at least pause this full season or this Grand Prix season. All four reigning U.S. champions, however, competed in Everett. On Friday night, there were about 2.000 spectators, on Saturday and Sunday around 2.500. 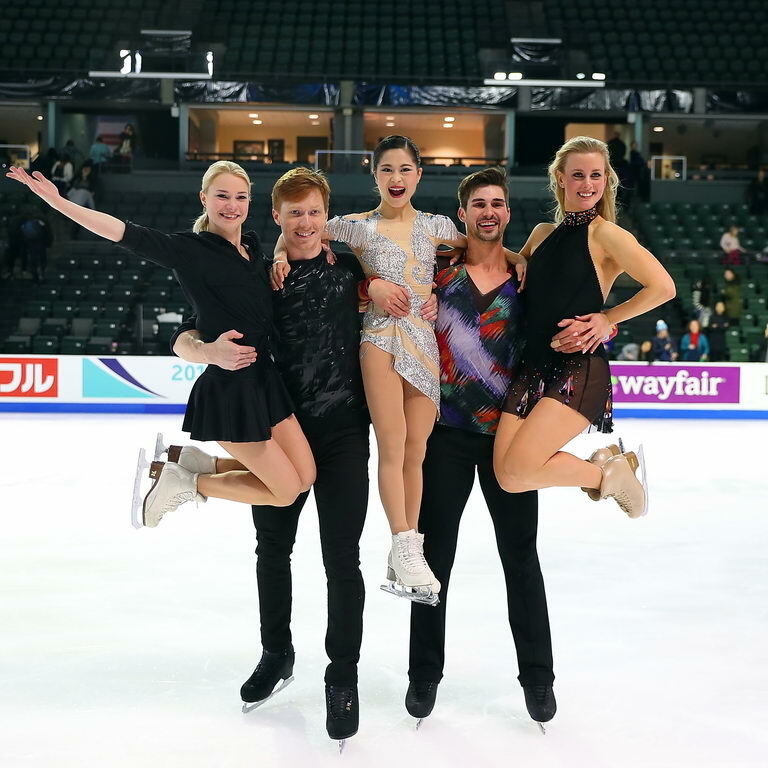 This week, a handful of the world’s leading skaters will battle it out in hopes of making the podium at 2018 Skate America, the first of six world-class showdowns comprising this season’s International Skating Union Championship Grand Prix series. This celebrated annual event will be held at the Angel of the Winds Arena in Everett, Washington, a 10,000-seat venue operated and owned by the Stillaguamish Tribe (who manages and oversees the Angel of the Winds Casino Resort in that same area) from Friday, October 19th through Sunday, October 21st. This year’s Skate America roster features an elite group of 60 ISU-ranked skaters representing 12 different countries who will compete in the men’s and ladies singles, ice dance and pairs disciplines. American entries include Nathan Chen, the 2018 World and two-time U.S. champion, Vincent Zhao, the two-time U.S. medalist (silver in 2017 and bronze in 2018), Bradie Tennell, the 2018 U.S. titlist, Alexa Scimeca Knierim & Chris Knierim, the two-time U.S. champs and Madison Hubbell & Zachary Donohue, who took silver at the 2018 World Championships and 2018 U.S. gold, all of who represented the U.S. at the 2018 Olympics last winter, among other standout American and international contenders. The ladies field is formidable. Leading the U.S. contingent is Bradie Tennell, the 20-year old Illinois native who last year, scored bronze in this competition. She is expected to rack up high marks with her impressive library of high, quick triple jumps and high-octane spins. Starr Andrews, the 17-year old California native who placed sixth at the 2018 U.S. Championships should also score high points with her electric jumps, artful spins and compelling artistry. Megan Wessenberg, a 2018 U.S. ladies contender from the Boston area, should also be a force in this showdown. She is known for her big triples and super-fast spins, among other things. In addition, skaters from such countries as Japan, Russia, France, Canada and Belgium competing in this event who are forces to be reckoned with. Satoko Miyahara, the 2017 Skate America champion and 2018 World bronze medalist, is expected to put out exceptional programs, as are her teammates, Kaori Sakamoto, the 2017 Skate America second-place finisher and Marin Honda, the 2017 World junior silver medalist. Polina Tsurskaya, the 2017 NHK Trophy bronze medalist and Sofia Samodurova, the 2018 CS Lombardia Trophy second-place finisher, should also represent Russia in fine fashion. Alaine Chartrand, the 2016 Canadian champion, is another contender to watch in this event. The men’s competition should also a memorable one. Nathan Chen, the jumping dynamo from Salt Lake City and defending Skate America titlist who is currently attending Yale University in New Haven, Connecticut as a freshman, ought to be up to his stalwart technical level. Vincent Zhao of California, who placed sixth at the 2018 Olympics, is also expected to knock out top-rate programs. Jimmy Ma, a Long Island, New York native and 2018 U.S. men’s contender, should also put together a strong series of programs here. Other contenders include Sergei Voronov, the accomplished Russian known for his exceptional technicality who was third at this event in 2017. Alexei Bychenko, the powerhouse jumper who trains in Hackensack, New Jersey and placed fourth at the 2018 Worlds, is also a formidable contender, as are veterans Kevin Reynolds, the six-time Canadian medalist and Michal Brezina of Czechoslavakia, among others. Leading the U.S. contingent are Alexa Scimeca Knierim & Chris Knierim, who last year, started training with 2018 Olympic champion Aljona Savchenko. They are expected to knock out a series of high-octane programs. The Knierims will be joined by American teammates Ashley Cain and Timothy Leduc, who were the gold medalists at the Ondrej Nepala Trophy last September and Nica Digerness and Danny Neudecker. Evgenia Tarasova & Vladimir Morozov, two-time World medalists in 2017 and 2018, will represent Russia, while Evelyn Walsh & Trennt Michaud, the 2017 World Junior silver medalists, will skate for Canada. Madison Hubbell & Zachary Donohue will lead the U.S troupe. They train in Montreal with decorated Olympic coaches Marie France Dubreuil, Patrice Lauzon and Romaine Haguenauer. Rounding out the American contingent are Karina Manta & Joe Johnson, who are based in Colorado Springs and Lorraine McNamara & Quinn Carpenter of Maryland. Other entries in this event include Charlene Guignard & Marco Fabbri of Italy, Tiffani Zagorski & Jonathan Guerreiro of Russia and Katharina Muller & Tim Dieck of Germany, among others. After each Olympic Games and the subsequent World Championships in Olympic years, many skaters announce their retirement or at least a time away from competition of some months or a year. This year more top skaters than ever did so. This offers the next generation of skaters a chance to establish, to be invited for Grand Prix and to begin to prepare for the next Olympic cycle until 2022. Most of those who compete now, plan to do so until 2022. Some countries, especially Canada, lost a whole generation of very successful skaters. One of the reasons is that Tessa Virtue & Scott Moir will organize a well-paid tour of around 60 shows through Canada in late fall (autumn) during the Grand Prix competitions and everybody wanted to join them Since the ISU published the Grand Prix entry list in late June, a lot of skaters who were on the list then, announced later (and some more will announce soon) they will not compete at this year’s Grand Prix. There is an important change in the Grand Prix locations: In mid-June China gave back the Grand Prix and all other figure and speed skating events of this season. The official reason is that the ice rinks do not have the necessary standards and have to be renovated before the Olympic Games of 2022. But the real reason, it is thought, is that the Chinese sport minister is upset with the ISU because in figure skating two Olympic judges were banned for one and two years because of too nationally influenced judging. And in short track two Chinese athletes were excluded during the Games because of unfair treatment of other skaters during the races. So the ministry asked the federation to skip all ISU events, which is quite silly. At first the ISU asked South Korea to organize a Grand Prix. In this case the traditional balance (two Grand Prix in Asia, two in America and two in Europe) would have remained. But South Korea did nor want to hold it. Then the ISU asked all federations. Finland has asked the ISU for years to get a Grand Prix, therefore the ISU decided to give it to Helsinki. If the Grand Prix is well done and the ISU gets good money from TV rights, is it possible that China will lose and Finland will get the Grand Prix also in the next years. In ice dancing, by far the most successful discipline of U.S. Figure Skating, 12 of the 24 couples who skated at the Olympic Games, will not compete the Grand Prix this season, with several having retired. The Olympic Champions Tessa Virtue & Scott Moir never officially declared their retirement, but nobody, including their coaches, expects them to come back to competition after winning two individual Olympic gold, one Olympic silver medal and gold and silver at the two team competitions of the Games. In late fall they plan to go on tour through Canada in about 50 or 60 shows. The second Canadian couple Kaitlyn Weaver & Andrew Poje plans not to compete at the Grand Prix, but to come back for Nationals, Four-Continents and Worlds. For their free dance, they will use the song which Denis Ten (who was killed on July 19th) had planned to use for his free program as a remembrance to him. Olympic bronze medalists Maia & Alex Shibutani will not compete this season and even their coach Marina Zueva does not know if they will come back next summer. Ekaterina Bobrova & Dmitri Soloviev from Russia officially announced they will take off this season, but often this is the first step to a retirement. Anna Cappellini & Luca Lanotte from Italy officially declared to retire and do only shows, but you cannot be sure of their announcement because they have sometimes have changed their minds. The same is true for the British champions Penny Coomes & Nicholas Buckland. Kana Muramoto & Chris Reed from Japan have officially retired, Kavita Lorenz & Joti Polizoakis from Germany have split and only Polizoakis looked (unsuccessfully) for a new partner. Yura Min & Alexander Gamelin who competed for South Korea, split and accused each other of behaving badly. Alisa Agafanova & Alper Ucar from Turkey retired as planned and Ucar is working as a coach in Marina Zueva’s rink and the Detroit Skating Club. Elected as athlete speaker, he is a member of the ISU dance committee. Lucie Mysliveckova & Lukas Csolley from Slovakia officially retired and Cortney Mansourova & Michal Ceska from Czech Republic unofficially split. Big favorites for another World title are Gabriella Papadakis & Guillaume Cizeron from France who are not sure yet if they will compete this Grand Prix this season. Hot medal candidates for Worlds and the Grand Prix Final also are the two American couples Madison Hubbell & Zachary Donohue as well as Madison Chock & Evan Bates. All these three teams train in the Montreal dance school. Piper Gilles & Paul Poirier from Canada may also hope for medals. Alexandra Stepanova & Ivan Bukin should be couple number one in Russia and hope to place higher at Worlds than last season, when they finished seventh. The second Russian couple Tiffany Zagorski & Jonathan Guerreiro is close (8th at Worlds). Charlène Guignard & Marco Fabbri are Italy’s best couple now and also hope to move up. U.S. dancers Kaitlin Hawayek & Jean-Luc Baker, 10th at Worlds and alternates for the Shibutanis, hope to qualify for Worlds again at Nationals if they beat the rising World Junior silver medalists Christina Carreira & Anthony Ponomarenko as well as former Junior World Champions Lorraine McNamara & Quinn Carpenter. The two strong Spanish couples keep competing, and time will show if Olivia Smart & Adrian Diaz (12th at Worlds) or Sara Hurtado & Kirill Khaliavin (12th at the Olympics) will be the national team number one. The Danish team of Laurence Fournier Beaudry & Nikolaj Sorensen who were not allowed to compete at the Olympic Games because of the Canadian citizenship of Beaudry, changed countries and will compete for Canada from February 2019 on. They hope to qualify for Four Continents and Worlds. The relatively new team of Carolane Soucisse & Shane Firus, who train in the same Montreal dance school as Beaudry & Sorensen, also hope to get a spot for Canada at these championships. Among the ladies, there are much less retirements and competition interruptions than in the three other disciplines. In June, the 2018 World Champion Kaetlyn Osmond announced that she will not do the Grand Prix in 2018, in August she added that she will not compete this season at all. Her coach Ravi Walia said she had so much stress after her world title that she needed some rest in the summer. But he said she trained almost every day to prepare for the tour in the fall. Mirai Nagasu did not retire officially but has other plans. Nicole Rajikova from Slovakia who lives and trains in Hackensack, New Jersay, finished university and got an offer in July to start a high-level diplomatic job at the U.S. embassy of Slovakia. If she likes this job she will definitely finish her skating career. The door for medals at the World Championship seems widely open for those Russian teenage skaters who are old enough to compete at the senior level, among them certainly the Olympic Champion Alina Zagitova, the 2017 World Champion Evgenia Medvedeva, who now trains with Brian Orser, Maria Sotskova, Elizaveta Tuktamysheva (who re-learnt the triple Axel) and Polina Tsurskaya. The quad jumper and Junior World Champion Alexandra Trusova, however, is still too young to compete at the senior level this season. Other top skaters in this season might be Satoko Miyahara, Kaori Sakamoto and several other junior skaters from Japan as well as Dabin Choi and Hanul Kim from South Korea. Carolina Kostner from Italy has not said much about her future, therefore she is on the Grand Prix list, but in the summer she trained neither in Oberstdorf,Germany nor in Russia. In the USA, Gracie Gold announced her comeback and she is invited to the Rostelecom Cup in Moscow. Bradie Tennell and Karen Chen might be other candidates for Worlds, but a medal would be a surprise. In Canada, Gabrielle Daleman and Alaine Chartrand continue. Loena Hendrickx from Belgium might be a rising star, Nicole Schott from Germany continues her career as well. Former World Champion Javier Fernandez said he will compete only at Japan Open, perhaps Spanish Nationals and probably Europeans, and then will definitely finish his career. Patrick Chan from Canada retired, but the country’s second male Olympian Keegan Messing hopes to win Canadian Nationals. Kevin Reynolds also aspires this title. U.S. Champion Nathan Chen plans to continue and hopes to win a medal at Worlds again, but he must cope with training in California and attending University on the East coast. Adam Rippon does not compete in this season and it is open if he ever comes back. Max Aaron officially retired whereas Jason Brown continues and is coached now in Toronto. Vincent Zhou continues as well. Jorik Hendrickx from Belgium will skip at least his Grand Prix and said otherwise he will keep all options open. Junhwan Cha from South Korea and Deniss Vasilievs from Latvia might be rising stars. Michal Brezina from the Czech Republic continues as well as Alexander Majorov from Sweden. Daniel Samohin from Israel plans to continue and the other Israeli Alexei Bychenko was not sure in the summer what to do, although he had announced last year he would finish his career after the Olympic season. Misha Ge from Uzbekistan had said in spring he would finish competing, but the year before he had said the same and then decided to come back. Brandon Kerry from Australia and Matteo Rizzo from Italy hope to rise. Favorites for the medals at the Grand Prix Final and the World Championships in Japan will be Nathan Chen, the top two Japanese skaters Yuzuru Hanyu and Shoma Uno, who both continue. Other Japanese skaters like Kazuki Tomono and Keji Tanaka might fight for medals as well. The Russian skaters Michal Kolyada, Dmitri Aliev and Sergei Voronov also hope to be strong enough to place on the podium. The Olympic Gold medalists Aliona Savchenko & Bruno Massot from Germany decided to skip at least all competitions during this season because they plan to do many shows and especially Massot was quite exhausted and had back problems last season. But Savchenko said she does not exclude coming back before the next Olympic Games. Bronze medalists Meagan Duhamel & Eric Radford from Canada finished their competitive career after last season, as well as the Italians Valentina Marchei & Ondrej Hotarek (6th in Pyeongchang). The Canadian couple of Julianne Séguin & Charlie Bilodeau (9th in Korea) split, mainly because Séguin gained some weight. The other Canadian pair Lubov Iliushechkina & Dylan Moscovitch quit after they were not nominated for the Olympic Games. She now works with the Cirque du Soleil, he is looking for a profession. The Russian couple of Kristina Astakhova an&d Alexei Rogonov split as well, and Rogonov plans to continue with Alina Ustimkina, whereas Astakhova has finished her career. The Czech couple Anna Duskova & Martin Bidar split as well and both made several try-outs in the summer with new partners. The top two Chinese pairs withdrew from their Grand Prix, officially because of injury problems. The Olympic silver medalists Wenjing Sui & Cong Han will pause because Sui’s broken foot has not healed yet. Xiaoyu Yu & Hao Zhang also withdrew from their Grand Prix because of injury. Ksenia Stolbova & Fedor Klimov from Russia split after not being allowed to compete at the Olympics. Stolbova now trains with Russian skater Andrei Novoselov (in Hackensack under Nikolai Morozov) who had competed for France in the last four years, but never got French citizenship. Klimov retired, but did not exclude a comeback with another partner in the future. Evgenia Tarasova & Vladimir Morozov now train mainly under Maxim Trankov and hope for a title at Worlds, as well as the French team of Vanessa James & Morgan Ciprès who continue to train in Florida under John Zimmerman. The second Russian pair Natalia Zabiiako & Alexander Enbert also continues competing, as well as Italy’s Nicole della Monica & Matteo Guarise. Kirsten Moore-Towers & Michael Marinaro are the best Canadian pair now and have high hopes - their first goal reaching the Grand Prix Final. The North Koreans Tae Ok Ryom & Ju Sik Kim plan to compete longer as well as Germany’s Annika Hocke & Ruben Blommaert. A rising pair might be the Junior World Champions Daria Pavliuchenko & Denis Khodykin from Russia who compete in their first senior season. Four U.S. teams might battle for one spot at Worlds: Alexa Scimeca Knierim & Chris Knierim, whose main coach now is Aliona Savchenko in German; Ashley Cain & Timothy Leduc who stay in Texas; as well as Tarah Kayne & Danny O’Shea and Haven Denney & Brandon Frazier.